The original Broadway company of "Newsies." Extra, Extra! 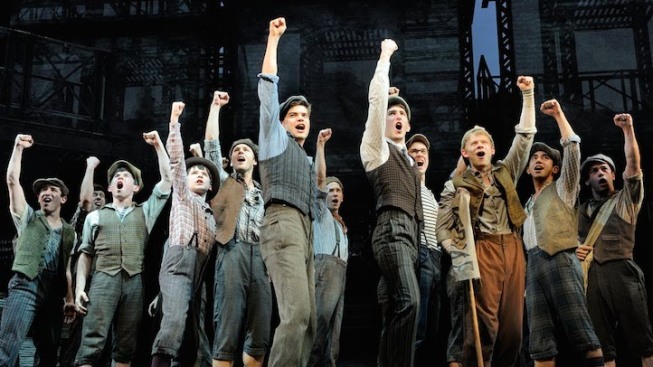 “Newsies,” the Tony-winning musical based on the cult 1992 film of the same name, will play its final performance at the Nederlander Theater on Aug. 24. A North American tour launches in October, stopping in 25 cities over 43 weeks during the 2014-15 season. “Newsies” had a rather unconventional road to the Broadway stage. Disney Theatrical Productions originally developed the show for licensing in response to requests from professional and amateur theatre groups. A four-week pilot production was put on at New Jersey's Paper Mill Playhouse in the summer of 2011, in hopes that the show would then embark on a touring production. An overall positive response from critics and audiences then lead to a limited run Broadway transfer. Which then turned into an open-ended run after box office (and Tony) success. When it closes, “Newsies” will have played 1,005 performances on Broadway — a far cry from the 101 performances originally intended. The show has seated over 1 million patrons, earned over $100 million and is the second longest-running show ever to grace the stage at the Nederlander Theatre (behind “Rent”). It also recouped its investment in just 41 weeks -- the fastest a Disney production has ever turned a profit.